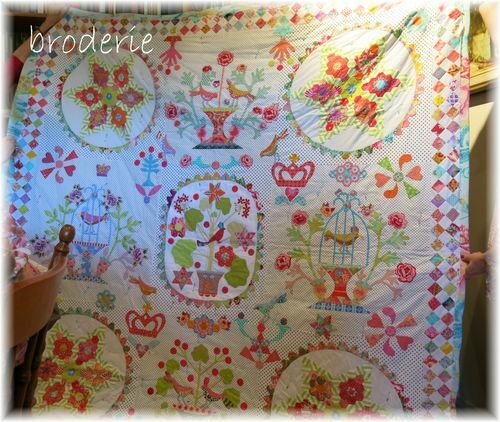 Hello, all, sorry I've been a while getting round to posting but I've been quite busy on the domestic front, and have been waiting for an email from a quilter/blogger in Australia- more of this later. Above you can see a photo of a quilt block and border strip which I have been working on/thinking about for ....erm....a couple of years now! Admittedly I have completed other projects along the way, but this has been hanging about for an embarrassingly long time. Mainly because I've had a blank spot about how I'm going to continue with it. I know I'm going to surround each appliqued block (pattern from an old book by Jan Patek) with strips of squares - how many rows I haven't yet decided. But what next? The solution came from Blogland, as so many good ideas frequently do. There are two Australian blogs I've been reading for quite some time now, which I'm sure you'll enjoy. The first by Elizabeth of Broderie and the second is by her friend Jean, of Linen and Raspberry -check them out, you'll love their style. These two friends have been involved, with others, in quilting workshops with an eminent Australian quilter/tutor, called Margaret Sampson George, who I first heard about years ago when I saw her work in an Australian quilting magazine. 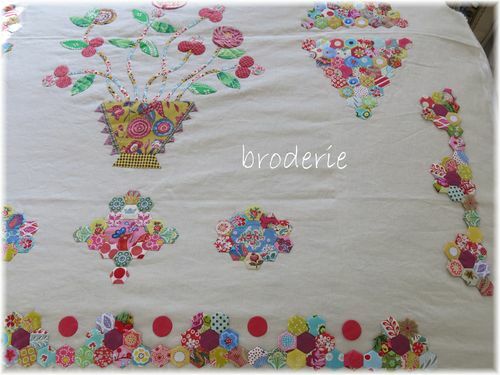 I was instantly hooked by her fabric choices, and her use of naive style appliqué. 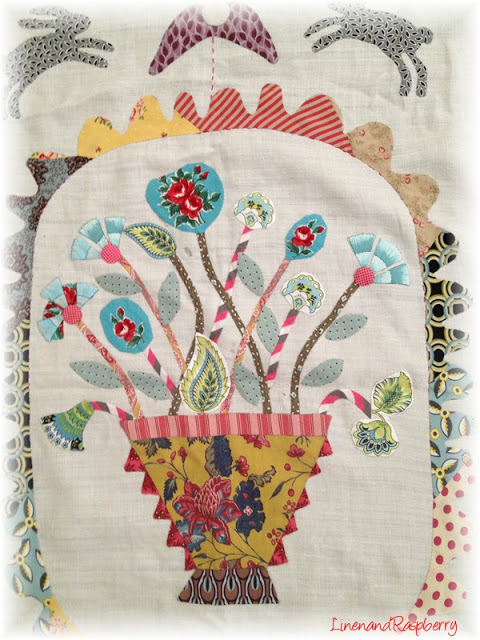 These small quilts were inspired by Margaret's quilts - her use of naive baskets, her border treatments and layout. I designed my own baskets, or copied as well I could (you know my standard of drawing!) from pictures of antique naive quilts. These I machine appliqued at the time, and I wish I had stitched by hand, now, but I am still very fond of these little quilts. 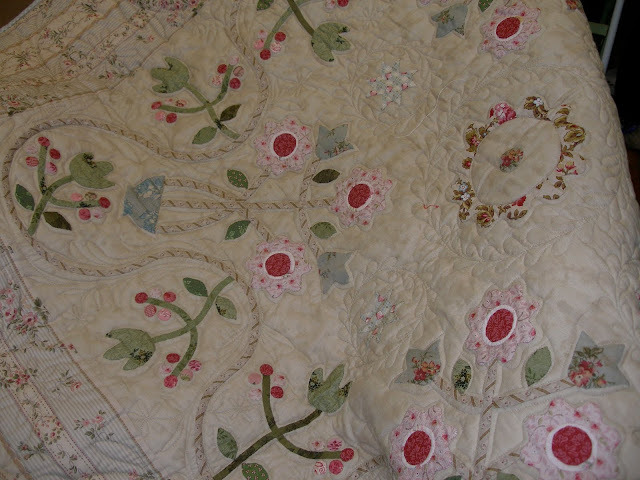 It was also when I began stipple quilting by hand, to give that lovely antique look. 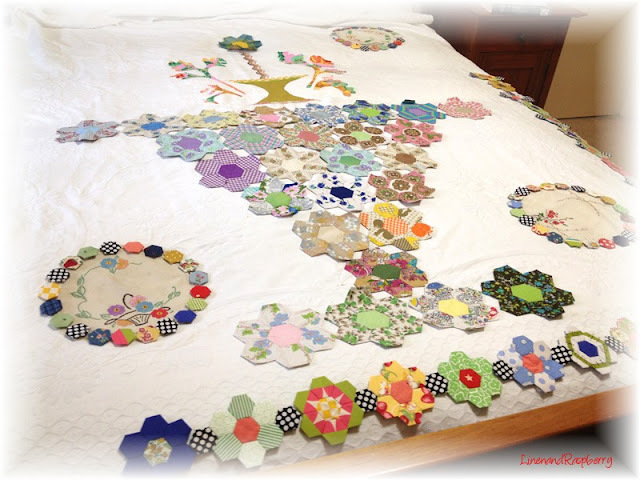 So a big thank you to Margaret - and she is still inspiring quilters with her unique approach and great designs. 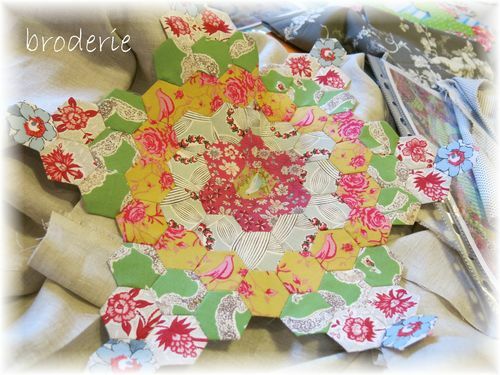 She herself has been inspired by some old English medalion quilts - what goes around comes around! Elizabeth and Jean are currently working on quilts taught in Margaret's workshops, and have given me permission to reproduce their photographs here. 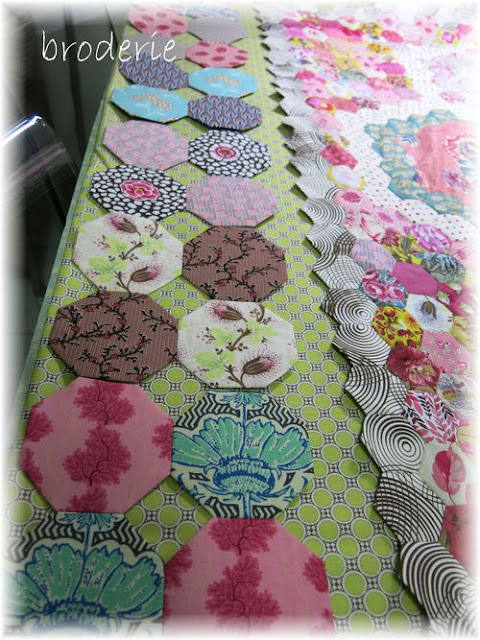 The first photographs are demonstrably from Elizabeth's blog, though not all are of her own quilt top. 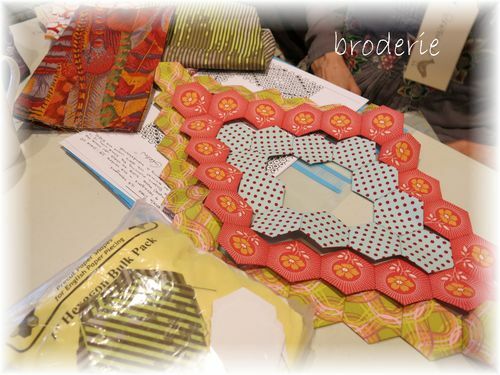 I was stunned to see that almost all the appliqued motifs are composed of hexagons, which are then appliqued to the background fabric - hence the ongoing work is referred to as The Sheet! I love it! 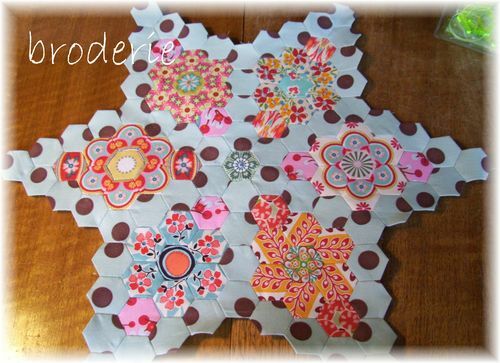 The hexagons are built up into differently shaped larger motifs, arranged on the ground fabric and stitched down. A lot of hand-work involved, but I am getting further and further away from enjoying machine work these days, which is why this method really appeals. 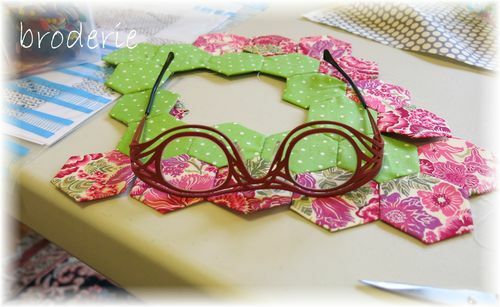 It isn't fast, but the leisureliness of cutting and hand stitching each hexagon really appeals. 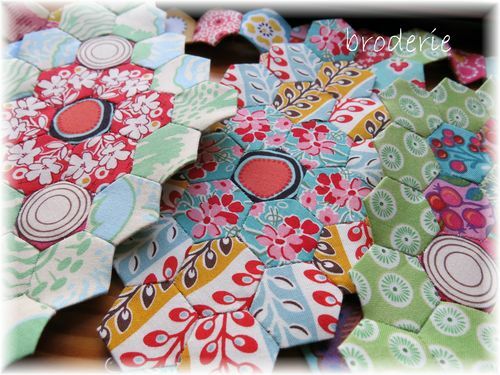 Never seen hexagons used so beautifully! See how differently the hexagons can be arranged. The following eight photographs are from Jean's blog; they are not all of her own quilt top. 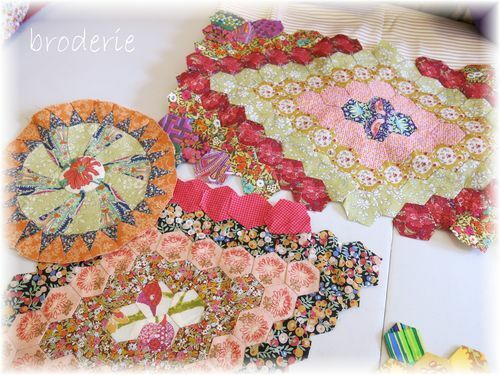 I love the way the old "Granny's flower Garden" lay-out has been transformed by adding units in different ways. So there we have it - my decision is made. 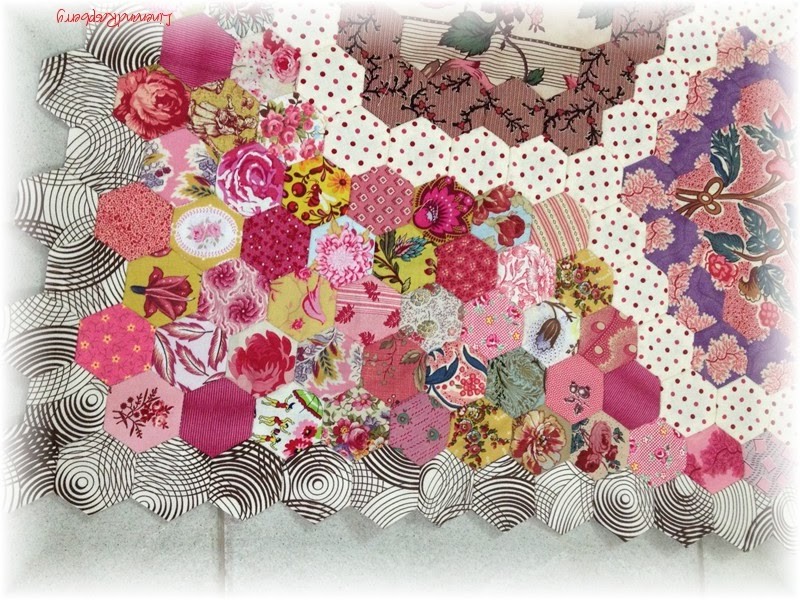 Once I have surrounded each of my applique blocks with the squares, I shall cut out my border strips and then spend some peaceful hours making my hexagons, designing the motifs and deciding how to place them on the background. This quilt isn't going to be finished any time soon - but that's ok, I'm into 'Slow Cloth' anyway - but I'm going to enjoy every step of the way. Thanks Elizabeth and Jean, you have cured my 'Quilter's Block"! Just discovered your blog through potterjotter! 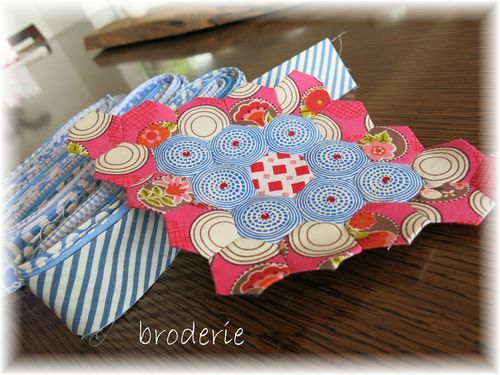 delightful, and thanks for the link to Broderie - I love working with hexagons. Am coming over to Norfolk too this week, to visit my brother and am hoping to move there in next year or two. I will enjoy looking through your blog. Hello Rose, thanks for commenting, and welcome to Norfolk - keep in touch! 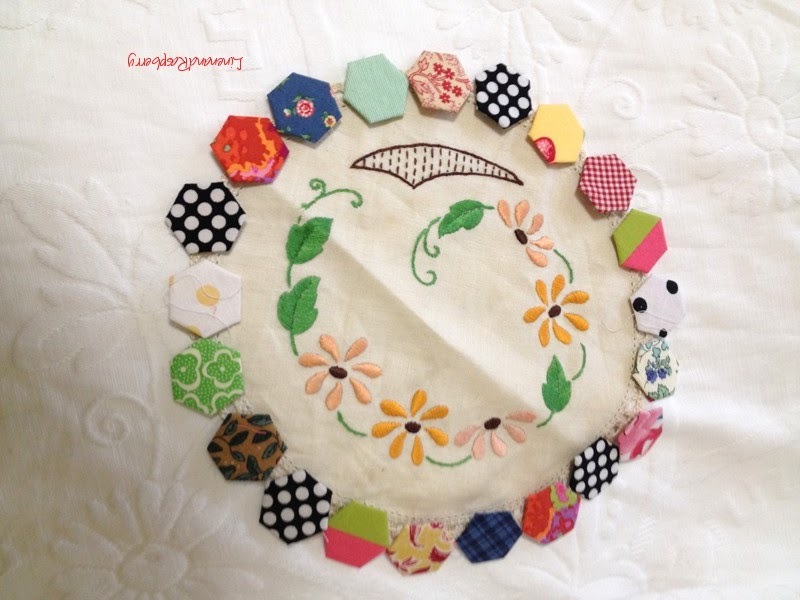 I am blinded by the light, well by envy of all that wondrous work your little quilts are lovely. I need to live for another 100 years so that I can sew every thing that I want to. 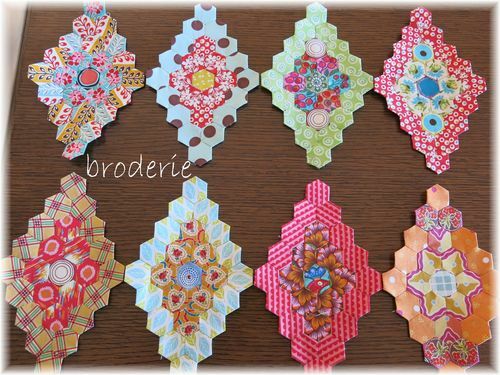 I am a sewer and don't quilt but have always wished i could...I have been given a bag of hexies' and hope to use them as an appliqued design now i have seen your lovely post....thank you for sharing.. Your quilts are fabulous. Not sure I would have the patience but love the idea of the baskets. How on earth are the hexagons joined to one another? Love the stipple effect. 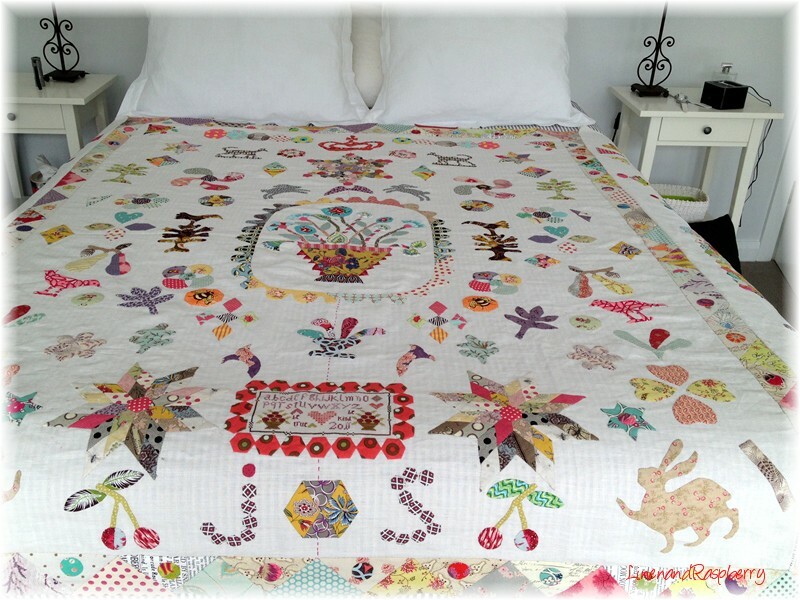 What stunning quilts - all of them. I do so wish I could do even a small one like those. 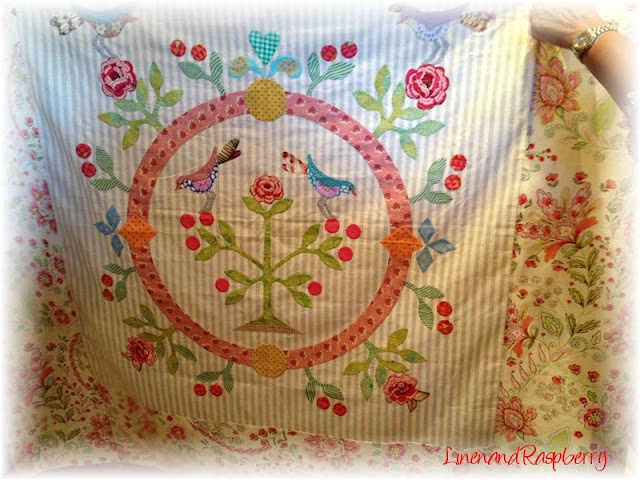 Beautiful quilts and so inspiring, no wonder your quilter block is shaken off! 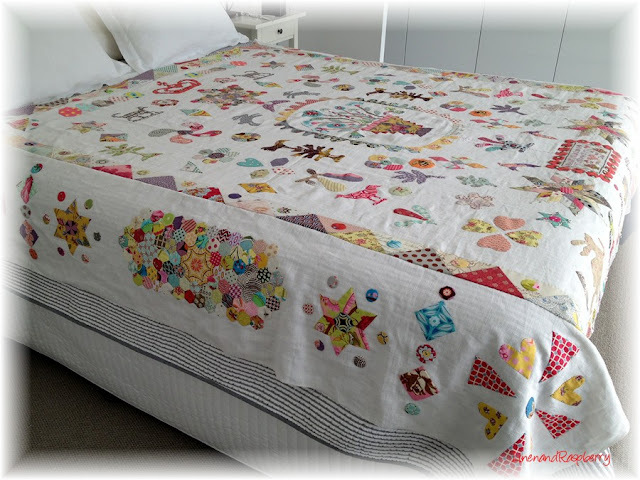 I really enjoyed your blog and the last picture of the quilt is lovely can I place my order now for when you start making yours. If I didn't have such rickerty forefingers I might even think about having a go not that I can see properly to even thread a needle. I have had to look at these pictures several times as I have never seen hexagons used in this way. Brilliant and I love your appliqué work. Hand quilting is a bit of a challenge, sure will look good when done. There is a blog award for you over at mine if you would like a little bling for your blog. 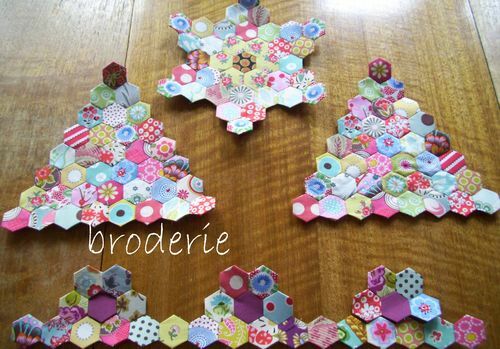 Hi Jane, I too, was a bit gob-smacked by their use of hexagons, never seen them appliqued onto a sheet before, how effective they look. And thank you for the blog award - like you I'm not terribly into them, but I do thank you in the spirit in which it was sent, and I will endeavour to get it onto my page - I've managed it twice but have forgotten how to do it!! Watch this space! Wow, this point is so full of inspiration and beauty! 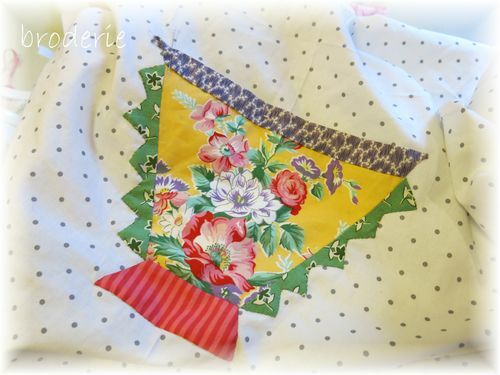 All of the projects are wonderful, from your applique baskets to the hexies. Lovely, lovely, lovely. They are gorgeous and look forward to seeing your finished work. Blog land is so great isn't it? I've often been inspired by others' posts and people can be so kind and helpful too. 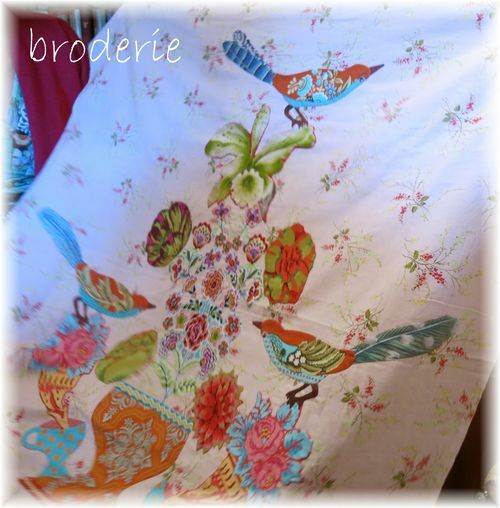 I adore your applique, its just so pretty, gorgeous selection of fabrics and so much attention to detail....stunning! !